Go to " Channels" page. 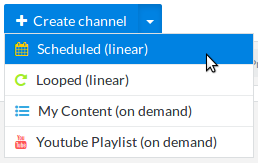 Here you can create a scheduled channel by clicking in the "Create channel" dropdown button and then choosing "Scheduled". Then type the channel name and customize it by adding a logo (preferably PNG with transparent background) at the top left or right, a logo link, the color you want to appear on the player control and a twitter account. Weekly: you will schedule a whole week 24/7 and content will be repeated weekly. Daily: you will schedule one day (24 hours) and content will be repeated daily. Then press " Next" to create and schedule the channel. 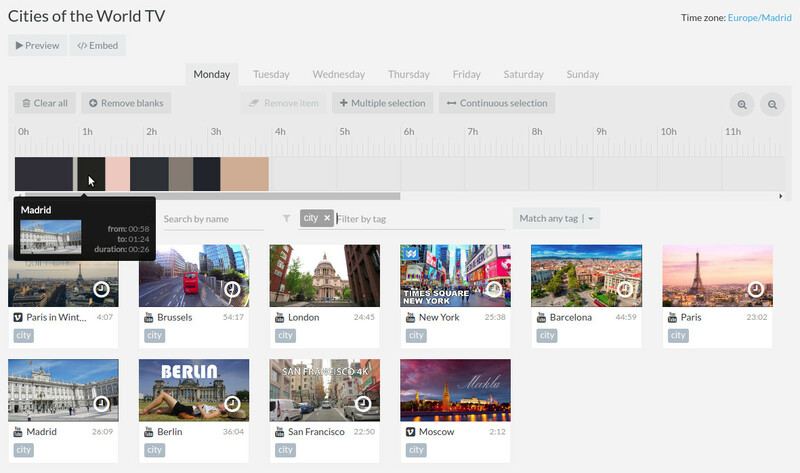 Now select the day of the week that you want to schedule (if you previously selected Weekly) and drag and drop the content into the scheduler section to the preferred time or click on "+" button to add to the end of the list. When an item is added to the current scheduler, a clock is shown in the item. Note that the Scheduler area includes Keyboard support for quicker management, so you can use the Left/Right arrows, Ctrl, Shift and Delete keys. Multiple selection: activate this function to select multiple items. It works as the Ctrl shortcut. Continuous selection: activate this function to select all the contiguous items between two items. It works as the Shift shortcut. Clear all: click on this button to remove all items of the current scheduler. Remove blanks: click on this button to remove all blank spaces on the scheduler. All content will move to the left without blanks. Zoom In/Out: click on these buttons to zoom in or out of the scheduler's size. Finally the created channel will be continuously running 24/7 repeated daily or weekly depending on its duration. Be sure you have set your Time zone to your Area from the settings page. 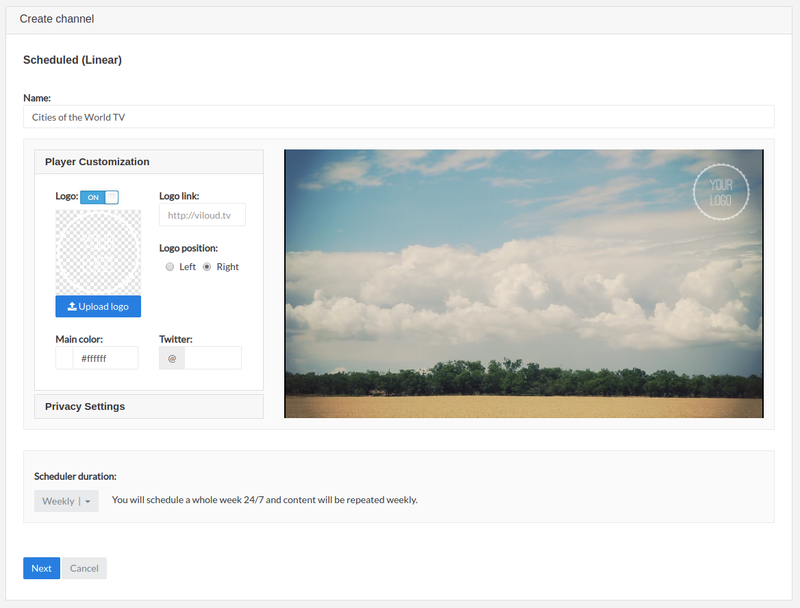 Once your content is scheduled you can Preview or Embed the channel clicking on the corresponding buttons. Here you can find a detailed information about how to embed the player on your site.